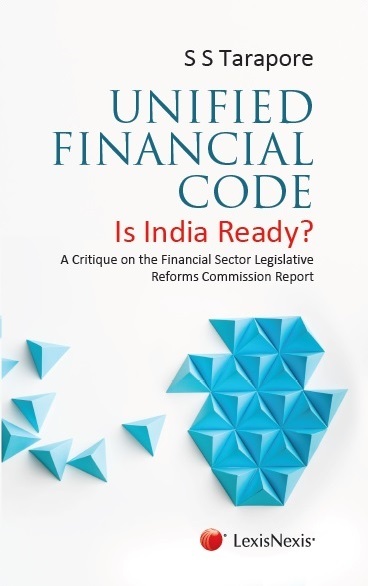 This book debates India’s readiness to adopt a Single Unified Financial Code proposed by the Financial Sector Legislative Reforms Commission (FSLRC), which was set up in 2011 by the Ministry of Finance to review the existing financial legislative structure. It recommended a total overhaul of legislation regulating the financial sector in India. A compilation of 24 articles and 4 papers published in reputed newspapers and journals, this book examines the key issues and discusses the hazards of hasty implementation of the FSLRC’s proposals without building consensus amongst stakeholders. The book highlights the need for a detailed examination of the proposed changes by Parliament, financial experts, economists, lawmakers, policymakers, market players and academicians, before major legislative changes are enacted and enforced. TESTIMONIALS This slim volume is a compilation of writings by Savak Tarapore, an eminent central banking economist. The book focuses on issues addressed by the Financial Sector Legislative Reforms Commission. Tarapore rightly criticises the Commission’s recommendations which, if implemented, would weaken the regulatory framework and he stresses preconditions necessary for legislative changes. Moreover, he opposes diminishing the authority of the Governor and the functioning of the central bank. Tarapore’s words of wisdom are as timely as they are relevant. I commend the book to a wider readership. Tarapore offers through these essays a trenchant criticism of FSLRC Report. As always, he writes lucidly and with conviction. Notwithstanding my disagreement with several of his conclusions, I have no hesitation in saying that this book will play a key role in shaping future legislations governing India’s financial system. Savak Tarapore presents some well-argued cautionary criticism of some of the proposals made by the FSLRC in the name of financial sector reform. Tarapore has been a consistent supporter of financial sector reform but he also believes that reform proposals must be carefully considered. This is especially so when they involve the wholesale removal of an existing body of laws, which may well be flawed in some respects but are by now well understood and tested in Courts. The new legislation replacing them may well be better, but we will not know until it is tested in the Courts. Tarapore warns that the new proposals must be considered in great detail and with great care, more so than is normally done with new legislation. Everyone interested in the subject would do well to read this book very carefully. This book is an eminently readable account of the hazards of the current thinking on Indian financial sector legislative reforms. The book is a must read for lawmakers, policymakers, market players, academicians and Parliamentarians. If I had to choose one book to read on the financial sector legislative reforms in India, it would be this slim volume.